When I first learned to play golf as a 10 year old junior at Shanklin & Sandown Golf Club, I would head out to the practice short game area with a sand wedge or a lob wedge and practice hitting a bunch of shots way up in the air. These shots look cool, they are fun to hit, and me and my friends would try to get as much spin on the ball as possible and spin it back on the green. This was the first thing we would always practice. The further along in my career I got, I eventually started to realise that this was not always the best shot to play around the greens. Yes it’s a lot of fun and it looks great, but when I started to play in monthly medal and stableford competitions I learned something. I would hit one of these great shots that look good on the eye, it would fly high and get maybe 5-6 feet away from the pin. Then my playing partner would step up faced with a similar shot around the green, an older player with lots more experience, and hit a nice little chip and run shot. It looked super easy with nothing fancy and would roll 3-4 feet inside of my ball. My shot may have looked cooler to eye, but the results just weren’t as good! I’m going to talk about club selection, and how to know which club to use when chipping around the green. This will help you select the smart shot to help you achieve smart results. 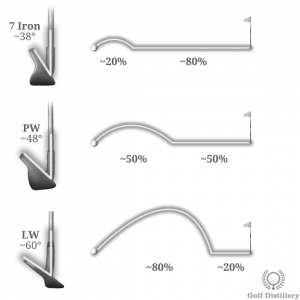 Below is a chart explaining the roll to carry ratio you should look to see for three clubs (7iron, Pitching Wedge, Lob Wedge) when using them around the greens. This will help you to choose which club to use when faced with a particular shot. Lob Wedge: Using the most lofted wedge in my bag a 60 degree lob wedge, with the correct strike the ball should fly most of its distance (roughly 80%) in the air and stop relatively quickly. Pitching Wedge: Switching to a pitching wedge, we’d expect the ball to fly about 50% of the distance and therefore roll 50% of the distance. 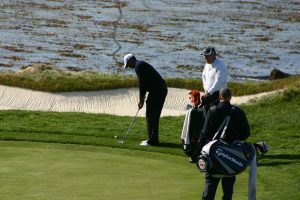 You will need to make a shorter chipping action because more of the power is transferred to forward momentum rather than getting the ball in the air. 7 iron: The ball will fly only about 20% of the distance and roll 80% of the distance when using this club. You make a very short chipping action because nearly all the power is transferred to forward momentum. Regardless of the club you select, the set up and chipping action remains the same. 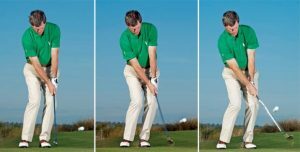 The only thing that changes is the length of your backswing and therefore follow-through. If you use these ratio’s I talked about in the table above and relate them to the particular shot you are faced with on the course, I guarantee your chip shots will get closer to the hole on a more regular basis. Thank you for reading my latest blog, if you would like to book a lesson with myself on chipping please call 01983 613131.